The Engineer is a very nice girl. She likes to dance and watch 'My Name Is Earl'. Take yesterday for instance. She had no resistance. Against a comedy which occasionally does twirl. As told to me by Writer: Peter Milligan; Artists: Eduardo Pansica and Ignacio Calero; plus Publisher: DC Comics in July 2012. Let's do the fandango? In many ways 'Devolver' is a tale that makes me wish that I took more notice during my history lessons. Well, sometimes the mistakes of the past can help you with the dilemmas of the future! Picture the scene if you will; since time began an ancient race called the 'hidden people' have been fighting Stormwatch for the sake of nethanderal rule. Now they're back --- and with them they are ready to devolve all in sundry with their 'Devolver' box. 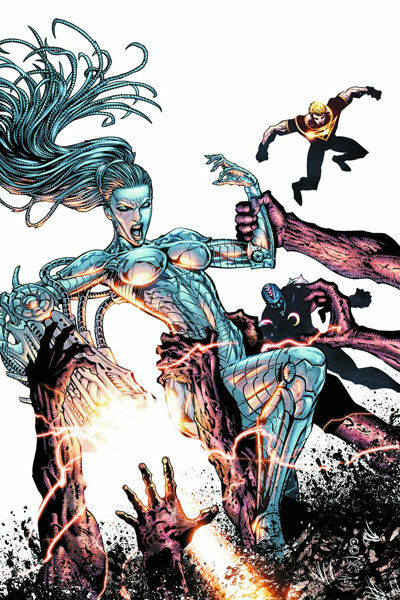 Thankfully, though, the Engineer has a plan derived from her own past which may help her team against this threat. No. It does not have anything to do with her one time lover, Harry Tanner. He's got plans of his own elsewhere. Instead, it involves what she can learn from her now dead predecessor, Archie Trundle, to turn the tables on these ugly sods. 'N... no. A man. But not a man. More like an Angel. Big metallic wings above the highway'. ... I thought it was. You see, in a very bizarre way this scene came across as if the big green git was playing charades with himself or something. Didn't it? The scope of this tale was great. Honest to God, any story that starts off a million years ago and finds its way back to the here and now, is a good story in my book. My favorite segment in this piece was the scene where the Engineer interfaces with her predecessor, and he tells her the tale of his demise. Also, what about that twist at the end, huh? Wasn't that a zinger? Martian Manhunter did foreshadow this possibility at the beginning of the yarn, didn't he? I have two slight gripes with this tale all in all. Firstly, Midnighters coy comments towards Apollo is starting to get a bit repetitive at the moment -- he's more than a walking cliché, right? And secondly, the art on this book was a mixed bag to say the least -- but I'll elaborate more about that matter later. STORY: I found the most creative thing in this yarn to be the Engineer interfacing with her predecessor's memories, uploading his prior experiences. Personally speaking, I found this concept to be both startling and intriguing at the same time -- and goes to show how innovative Peter Milligan truly is. ART: For me, when two artists illustrate the same story together, two things can happen. They complement each others work -- or they clash. Now in this issue I felt that they clashed. Please note though, I do not attribute this to the artist themselves - Eduardo Pansica and Ignacio Calero. Oh no! But rather to DC for assigning five different inkers to ink their work! No wonder the art was so inconsistent on this story, huh? One minute earthy. The next minute light. Excreta. Excreta. Excreta. Shame really -- and most probably all due to time constraints. CAVEMAN: Do I have to write anything here? What does the caption say? 'Caveman'. What does the picture look like? 'A caveman'. So what where you expecting? War and peace? Or maybe a sit-com made by 'NBC'? Ooops! 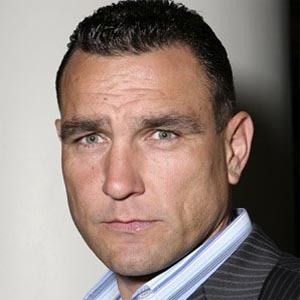 BLOODLINE: Vinnie Jones. Go on. Look at him. And tell me that you don't see the blood of a cave-man running through his veins. His doctor does. So it's medically proven, ha! Stubborn People Never Die; They Just Lay In Suspended Hibernation Until They Can Find Someone Else to Fight. Vote Conservative. On a conceptual level this issue was about an age old battle that has not resolved itself yet -- it's just lying dormant for the time being. OK, so what can I compare that too, huh? 'Alien Vs. Predator ' of course! Just with a better storyline and much more character. First off, please allow me to say that I really do love this series. Granted, it did begin on a rather awkward note. But once it started to find its footing a couple of issues or so down the line, it really did take off in a big way. However, I can foresee something going slightly astray if its not nipped in the bud sooner than later -- too many concept do not a good story make. You see, presently there is that whole Harry Tanner sub-plot brewing, this current Engineer going cuckoo-scenario, the missing artefacts ploy, plus let's not forget the origins of the respective team members also. Moreover, as a stellar-book, there is the added emphasis of explaining away concepts and gizmos for the reader to understand. Do you see what I mean by my previous remark? Still, I have faith that Peter will get his axe out and start hacking when the time comes. Bless him.